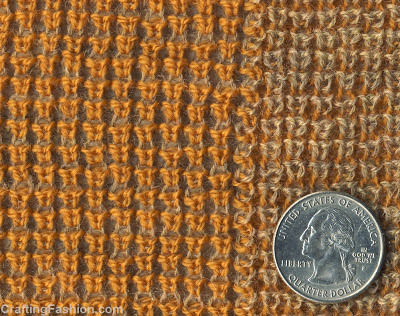 Jersey fabrics -- One face of the fabric has knit stitches (V-shaped stitches) and no purl stitches. The other face has purl stitches and no knit stitches. (A purl stitch is simply the back side of a knit stitch.) The cut edges roll toward the knit side and the selvages roll toward the purl side. 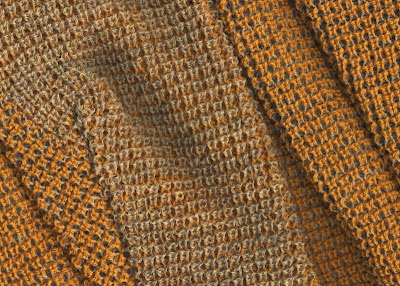 Rib fabrics -- Each wale (column of stitches) has knit stitches and no purl stitches, or it has purl stitches and no knit stitches. 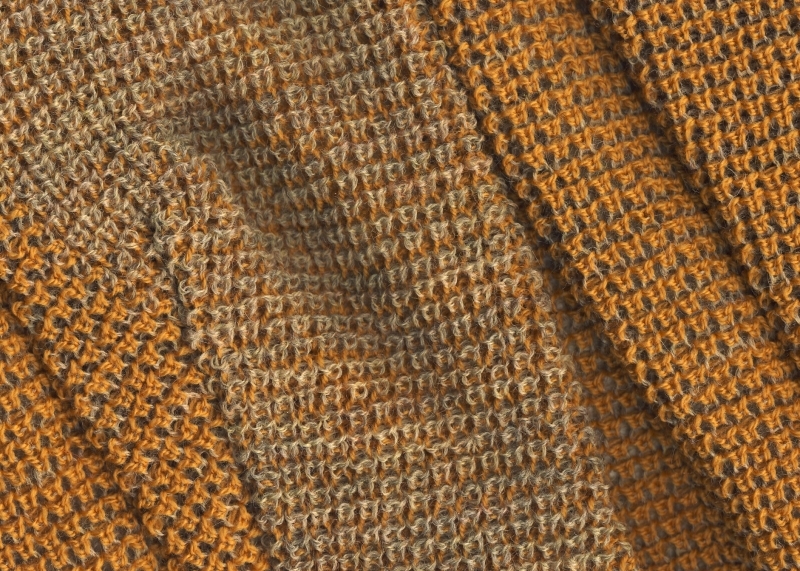 Sweater cuffs are often, but not always, a rib fabric. Double knits also fit into this category, though it may be hard to see the actual ribs unless you stretch the fabric. Balanced rib fabrics do not roll. This fabric has very distinct ribs. Both knit stitches and purl stitches are on each side of this fabric (for my new Crazy Crushed Can Cowl! ), but never in the same wale. Close up it's still a little hard to see the ribs. You'd have to stretch this fabric to really see them. Click photo for a closer look. 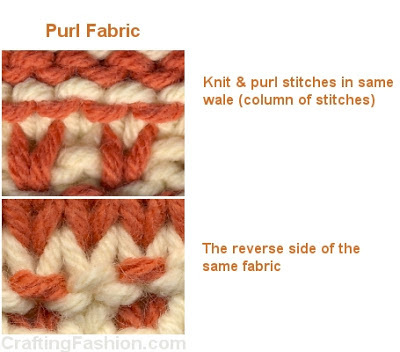 Purl fabrics -- Knit stitches and purl stitches share wales. The garter stitch is an example of this and so is this more complex 2-color fabric. This fabric doesn't roll. There can be other things such as tuck loops and slip stitches and cables thrown into the mix, but a knit fabric will fall into one of these three categories. Why all this matters is important. Before I cut out my Crazy Crushed Can Cowl, I've got to determine the size of the seam allowance I'll use. I think the size of the stitches, as well as other properties of the fabric matter in making my decision. My research on an appropriate seam allowance for "sweater knit fabrics" has, frankly, confused me. I've spoken to garment industry people and read articles written by professional seamstresses and sewing teachers and they are not in agreement. (The "proper" seam allowance seems to range from 3/8 of an inch to a full one inch!) I suppose that whatever they're using works for them, but I'll have to make my own decision based on my experience (primarily with necklines), my own fabric, technique and tools. I'm going to be doing lots of testing and then making my decision. 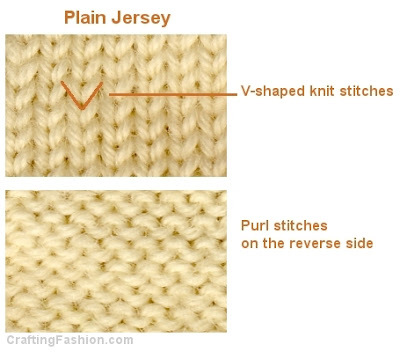 If anyone reading this has cut and sewn sweater knit fabrics, or has a better definition for "sweater knit", I'd love to hear about it in the comments. So how did you do your Crazy Crushed Can Cowl?? Hi, you can learn more about the cowl in this post. Info on the fabric can be found on my other blog, Knitting in the fastlane on this page.